Building Science Corporation's DER Builder Manual - just what Mass Save needs. Massachusetts utility sponsored, rate-payer funded, energy efficiency programs are great for a lot of people. The rebate and incentive programs are designed for volume - to impact as many rate-payers are possible and to get a lot of little energy savings through instant savings measures (bulbs), weatherization upgrades and basic insulation projects that average about $2,600. What Mass Save HES (Home Energy Services) doesn't do well is leverage homeowner investment to transform the building's energy and comfort performance. The large HES program is not designed for customers looking to radically transform their home. The energy audit is too short, the measure pricing is challenged. Generally, there is little incentive for home performance contractors or insulation installers to go above and beyond to serve the customer and design and install a comprehensive retrofit in the $15k to $50k range (what I like to call the MER, or middle energy retrofit). The lack of program resources for this scope of project, outside of mechanical system opportunities, is unfortunate because too many homes are being improved marginally, even when the customer energy saving goals and financial resources are better suited for a deeper level of retrofit. This may have changed with the re-release of the Mass Save Deep Energy Retrofit program. HIgh R-value mixed assemblies (including hot roofs!) spray foam, are now rebate-able through the Mass Save program- without fixed prices - meaning the narrow utility perspective of 'cost effective' has moved aside for market realities and a competitive market. This is great news for humankind! Especially for rate-payers in Massachusetts who are doing a gut renovation or a high performance deeper retrofit. The Mass Save DER program isn't for everyone, and certainly is not meant to fill the void between comprehensive DERs (80%+ energy savings) and 'standard' Mass Save program results (likely about 10- 20% savings) , yet it is an excellent step in that direction. The Mass Save DER Builder Guide [PDF] - 240 pages of soothing bedtime reading. The icing on the juicy DER cake is that the venerable Building Science Corporation has authored the Mass Save Deep Energy Retrofit Builder Guide (likely for a pretty penny) - 240 pages of geek speak and technical diagrams that are far more sensical than all the other technical resource guides released by the Mass Save program- combined . It contains a great intro for the uninitiated and aptly deals with ventilation and moisture. Chainsaw! Every approved assembly that qualifies for program rebates are detailed. One of two high-R wall assemblies that qualifies for the program. Rebates by the square foot of treated area - simple. Although there is a detailed application process, the DER rebate structure is straight forward. Incentives are for three specific building components - roof/attic, exterior wall, and basements. Total rebates awarded are based on square footage of treated area. Simply design your assembly to match the guide and you can bank the rebates. The performance incentive for all DER Measures is $1.75 per cubic feet per minute (CFM50) reduced based on pre-construction and post-construction blowerdoor tests performed by National Grid. What's missing in the DER guide - flexibility and exceptions to the design standards. I'd like to see more assembly options, or room for adjustments to the assembly designs while maintaining prescribed R-value and control layer properties. A few days ago I visited a gut rehab in downtown Northampton that would be a great candidate for the DER program. The GC is already on the partnered contractor list and I (soon to be on the partnered consultant list) am providing design and consulting services. The challenge is that this house has a unique wall structure made of 3-4" thick slabs of very wide boards. There is no wall cavity and no constant plane to fasten rigid board. A larsen truss, interior wall build out, or a more creative approach is needed- regardless, the solution will include lots of spray foam and not rigid board due to the uneven wall/sheathing surface. The DER guide only has two exterior wall options and both include 4" of rigid insulation with cavity insulation. This great opportunity for a DER may be dead in the water because the home is old and unique and does not have an even wall surface suitable to fastening rigid board. Many homes in Western MA are old and unique. It could be that there is some fine print in the application or guide that leaves room for assembly adjustments. On first pass, I didn't see it. Getting the word out - marketing and outreach so major renovation projects aren't missed. The new Mass Save DER program is an excellent addition to the suite of Mass Save programs. Builders and designers should be encouraged to get the word out about this program. There aren't many projects that are good candidates, so an outreach strategy based on community and professional networks is a favorable approach. 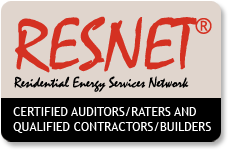 Utility program administrators should reach out to the contractor network and tap existing networks of qualified professional- such as the Mass Save New Homes HERS rater network - so that the word gets out and appropriate Massachusetts based retrofits get submitted to the program. I look forward to working with this program and hope to see some great projects come of it. Older PostHow much do architects know about new energy codes?